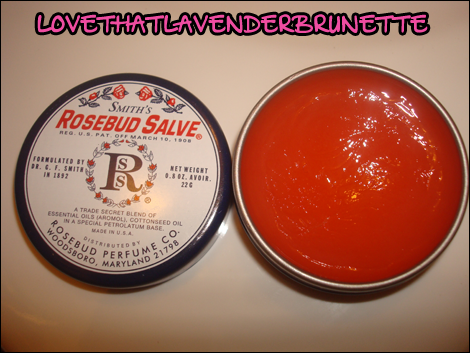 Strange And Pretty: No Regrets, Just Love: Smith's Rosebud Salve. No Regrets, Just Love: Smith's Rosebud Salve. 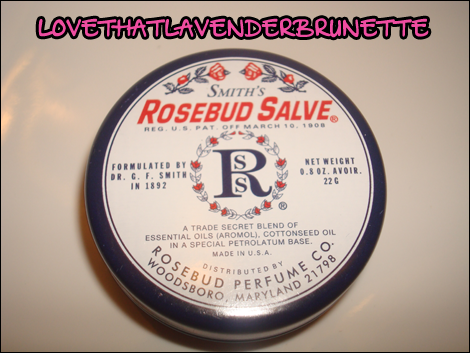 If someone ever asked me what would be my holy grail product of all time, it'd definitely my Smith's Rosebud Salve. This is one of the few products I've ever used that was a multitasker and actually GOOD at all of those tasks. I discovered this about two or three years ago - how I discovered it seems to be slipping my mind right now (most likely somewhere here in the beauty community). But since then, I've turned pretty much all my friends/family onto this little gem. I primarily use it as a lip balm, but it also serves as a cuticle oil, ointment for rashes, cuts, and burns, dry skin, and pretty much anything else you could ever imagine. It looks like it has a tint to it, but it doesn't. 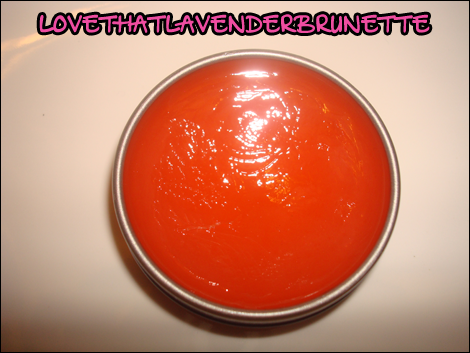 It goes on smooth and clear, and its consistency is similar to petroleum jelly, but not nearly as thick and heavy. It has that typical salve/oil sort of scent to it, it's barely there and not obnoxious, but it's there. Smith's also makes this in a few other scents, and I've tried a lot of them and love them just as well. I've purchased this from Sephora, but recently found out American Apparel also carries it, and is a few dollars cheaper. Plus, American Apparel usually knocks off a few dollars whenever you purchase three at a time. And I usually purchase three at a time - I know I will always love this and need it in my life. 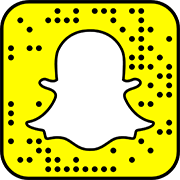 What's your favorite multi-functional product? I got one of these when I still was subscribed to Beauty Box 5. I keep it by my bed and use it every night on my lips. I may start using it on my cuticles. They usually need help. This works wonders on my cuticles...I tend to give them a rub down with this stuff every few weeks or so.